Two weeks ago, Mrs. Sniffles knocked on our “door.” I tried to convince her to leave with my homemade remedies, but she insisted on staying, so for the last two weeks we’ve been battling an unwelcome guest and nasty sinus infections. Mrs. Sniffles was sure to pack every “present” for her extended stay, too: runny nose, sore throat, tiredness, etc. Thankfully, after lots of rest, vitamin C, sore throat tea, elderberry syrup shots, and elderberry soda, Mrs. Sniffles finally decided to pack-up her remaining luggage and move on. Hallelujah! It’s wonderful to have energy and a clear head again. As it turns out, our family isn’t the only family who’s been affected by Mrs. Sniffles. She’s quite the experienced traveler! The entire school district in Pinellas County (where we live) has been hit hard by her visits. Some schools have seen dramatic decreases in weekly attendance since January. Right now is the perfect time to start talking about (and using) a light disinfectant spray. Or shall I say a replacement for the stuff found on store shelves? I’m sure most of us have vivid memories of heavily-perfumed sprays due to their popular use in restaurant bathrooms, homes, and even classrooms. Just the other day I noticed a store-bought spray and its infamous, headache-inducing scent in the women’s bathroom at Dustin’s work. Honestly, I don’t blame his work (or others) for using a store-bought spray, because marketing would lead me to believe that a store-bought solution, full of mystery ingredients, is the only way to properly clean and disinfect a room. Personally, I never once thought about what was in those sprays before our real food conversion, or even thought that a simple alternative may be sitting in my pantry or medicine cabinet. Alcohol may be used for much more than a strong cocktail. It’s also a very handy DIY ingredient, along with vinegar. Disinfecting takes care of more than just dirt, grease, or dust. 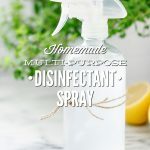 I don’t believe disinfecting every surface on a regular basis is essential in a modern-day home, thanks to indoor plumbing and healthy hygiene practices. Now when Mrs. Sniffles comes knocking, or I cut raw meat on my favorite cutting board, I’m all about using a homemade disinfectant spray. PS: I share my preferred approach for disinfecting a cutting board at the bottom of my recipe. And that, my friend, is exactly why I mixed up a bottle of my simple 3-ingredient homemade spray this past week. Take that Mrs. Sniffles! Pour the vodka into a 16oz. spray bottle, and then the essential oil(s). Shake the bottle to combine the vodka and oils. Finally, add the vinegar and water, and shake the bottle again. Recipe Update: This recipe originally called for alcohol, water, and tea tree. A few readers expressed concern with my recipe. As always, I want to share recipes that are effective. Live Simply is a personal blog, and I share recipes that I’m using in my home. After taking their comments into consideration, I’ve updated my original formula to include vinegar to help satisfy everyone’s particular needs. 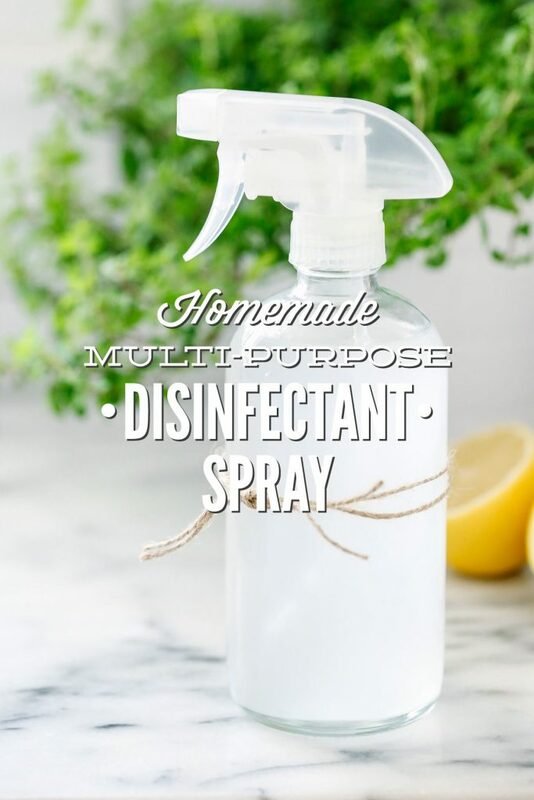 You can also see my current go-to all-purpose spray (which I also use as a disinfectant in my home), here. Vinegar shouldn’t be used on stone surfaces (such as granite). Essential Oil Note: I’ve also used a Bandit Oil (Thieve’s Oil or Germ Destroyer) blend in my spray. Learn more about the science behind using essential oils for disinfecting. Cutting Board Note: When it comes to disinfecting cutting boards (after cutting raw meat), I disinfect the surface using vinegar and hydrogen peroxide (do not combine these ingredients in one bottle! ); the order doesn’t matter. First spray one ingredient, letting the disinfectant rest for five minutes, then wipe the surface with a cloth. Finally, repeat with the second disinfectant. Wait five minutes, then wipe the surface with the cloth. You can see the entire process in this cutting board post. Another disinfectant spray option in the kitchen is a Bandit Oil Spray. Could you substitute the vodka with rubbing alcohol? Hey Lisa, Yes, you can. The only caution is that the odor will be very strong! I would also recommend reducing the amount to a 50/50 concentration versus the current recipe. Hi! Can this be used on carpet? Hey Jane, Based on my experience, yes it can :). Can this also be used as a spray hand disinfectant? Hey Mrsc, The vodka may be harsh on the hands (drying). Here’s my hand sanitizer recipe: https://livesimply.me/2014/09/17/diy-hand-sanitizer/. Can I use this on granite counter tops? Hey Ruth, Yes, it should be safe. I recommend decreasing the ratio to 50:50 water and alcohol, just to be safe. Also, spot-test first. Lovely recipe! I love homemade things and eco-friendly solutions! This multipurpose spray will be perfect for me. It come at a right time for me because the spring cleaning is about to start very soon. Thanks for sharing! I’m starting to get into homemade products like this-can I use this on wood floors? Hey Gina, Awesome! I recommend staying away from vinegar and alcohol when cleaning hardwood. This is my recommendation: https://livesimply.me/2016/04/30/homemade-floor-cleaner-multi-surface/. Can you use this as a fabric disinfectant/refresher, like Febreeze, or do you have another recipe for fabric? Hey AJ, You could definitely use this as a fabric refresher! Can I also add a few in-wash scent boosters? Hey Jazzybell, Can you explain what in-wash scent boosters are? Thanks! You should remove this post. Alcohol needs to be at least 60% for disinfection, that is why they sell rubbing alcohol starting at 70%. Telling people to dilute vodka, which is only 40% alcohol to begin with, and use it for disinfection is bad advice. 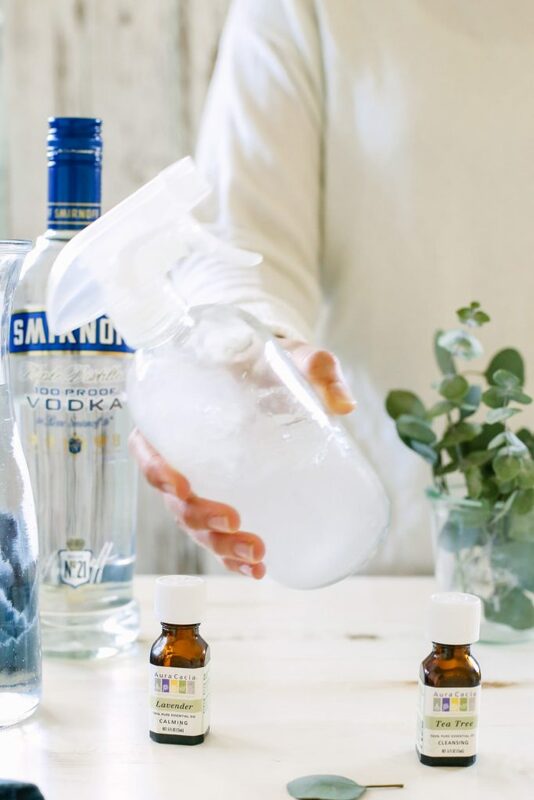 Even if your readers notice that you are using high proof vodka (which is not really Vodka any more, as Vodka, by definition is 40% alcohol), that is still not nearly strong enough for disinfection, as your “high proof vodka” is only 50% alcohol. Your mixture might make some pillows smell nice, but it is not wise to recommend people use it for fighting germs. Thank you for sharing, Brian! There are two mixtures used in the formula: 1. alcohol (or vinegar) 2. tea tree oil. I’m confused, so which vodkas/alcohols are actually going to be effective in this recipe? Unclear about your answer to Brian also. And if we sub out the alcohol with vinegar, that means 1 whole cup of white distilled vinegar? Hey Lo, Yes, you can use 1 cup of vinegar, or even 100% vinegar depending on the surface you’re spraying. 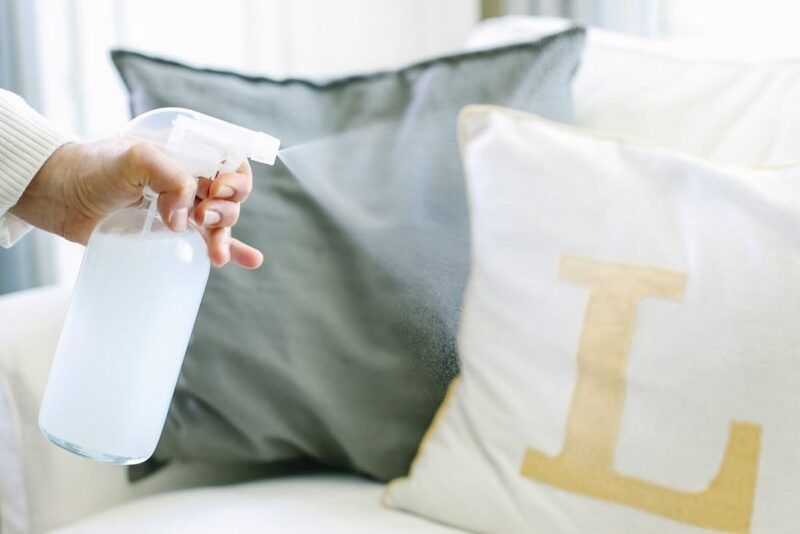 Rubbing alcohol is considered the most effective to my knowledge and reading on the CDC, but many people don’t like using rubbing alcohol when it comes to spraying something in the home. I definitely encourage you to read more about both on the CDC website. The recipe is what I use, so reading up on the ingredients (and studies) is highly encouraged. So glad I found this! I can’t wait to use this in my home! Very easy to follow the recipe. Well explained. The product has come out very good, smells fine and I use it always to disinfect areas which need to be. Has anyone tested this to see what germs are killed? I bought the ingredients today, but my kids have the flu and strep. I’m trying to avoid bleaching the whole house, but I’ve gotta kill the germs. In that particular scenario, I’d personally use 100% vinegar with tea tree, and also wash everything with HOT soapy water. I personally would use the strongest vinegar solution possible and also air out my home (opening windows and doors, if possible). Hey Kay, Yes, that’s what I would do :). That will work well. Welcome to Live Simply! Hey Eerika, Vinegar is known to be an excellent cleaner and disinfectant. What are the pros and cons between using vodka vs. using vinegar though? How do they compare? Hey Lo, From my research, vinegar is less controversial as far as it’s disinfectant properties. There’s more studies to support the use of vinegar in this role. Does this smell like vinegar? Hey Alicia, Yes, it will have a slight vinegar scent. The scent goes away after a few minutes. Okay, thank you. Unfortunately, my kids HATE when I clean with vinegar. Hi Kristen, I am wondering why the vinegar was added ? Are you saying the alcohol and tea tree alone does not disinfect? I’m only asking as I liked to used this on my counter tops intermittently and I have read that vinegar is not safe for granite. Thank you. Hey Craig, The alcohol and tea tree work great for that purpose (and most purposes, in my opinion). Always test a small area first before using it on stone or delicate surfaces. I added the vinegar for tougher disinfecting jobs which some folks felt tea tree and alcohol may not be enough for. hello Kristin, read in reviews that disinfectant can be made by just Vinegar and Tea Tree oil. I like half water and half vinegar and the tea tree, or 100% vinegar is always option for a surface that’s not delicate. What are your thoughts for using this as a surface spray on, leave on to air dry disinfectant for an in-home child care situation? Like to spray on toys and surfaces after the children leave for the day? My other question is would this discolor wood surfaces? We have mostly wood toys in my home-based preschool program. Thank you! The childcare centers I always worked in used a bleach/water solution for this purpose but didn’t have many wooden toys and in addition my home is bleach-free and we use only natural, essential oil based cleaners. Great recipe, thank you! I did want to alert folks that many essential oils are toxic to cats, including tea tree/melaleuca, lavender, peppermint, thyme, and others. Please do your research before using essential oils in places where cats can touch or even inhale them. I have discovered that rosemary essential oil is both an excellent disinfectant AND is safe for cats. Thanks, Laura. I’m glad you enjoyed it. Yes, we recommend everyone be informed and well researched when using essential oils. 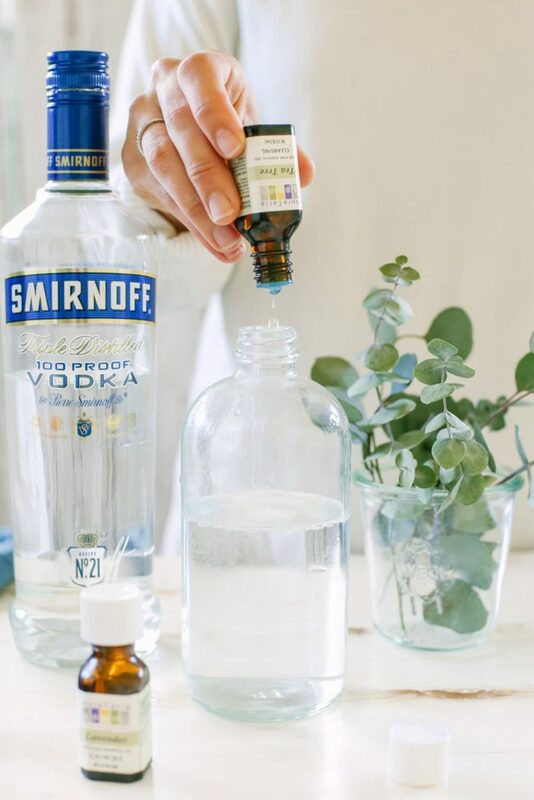 I forgot, I also wanted to address a question posted by someone else re: using just vinegar, water, and the essential oil… Mixing the essential oil with vodka (or other alcohol) before adding the other fluids keeps the essential oil suspended in solution instead of separating and floating on top. 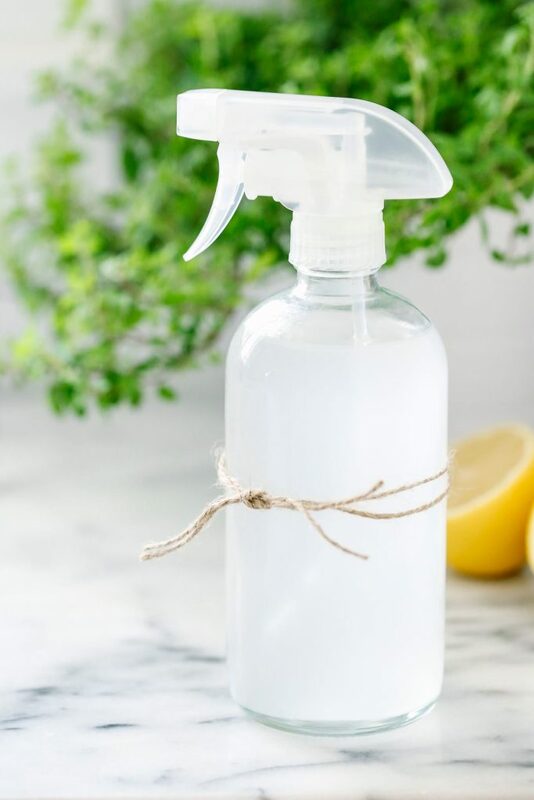 Anytime I use essential oils in my homemade cleaners, I ALWAYS mix them with cheap vodka or rubbing alcohol before adding the rest of the ingredients. This prevents you from having to shake the bottle every three seconds, and ensures that each spritz has the same ratio of ingredients. Hey Natasha, Yes, you can. Although tea tree is preferred. Hey Mary, It will keep for a month. You can decrease the amounts, too, if needed. I actually. Used wintergreen rubbing alcohol , vinegar, and water only. No oils. Im using it to disinfect the couch I slept on when I had a cold. It smells minty fresh now. Like the idea of this recipe but it will sure open your sinuses! 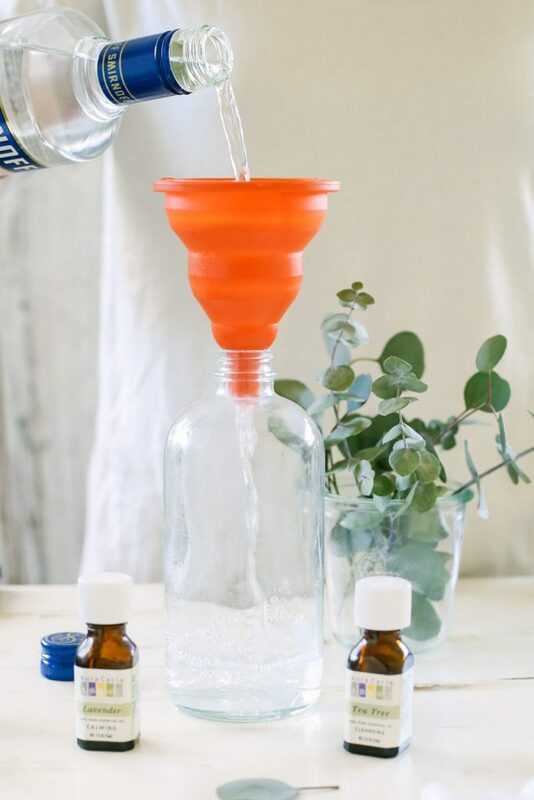 When using the rubbing alcohol and vinegar can I increase the water to a cup to help with the strong smell ? Or will that decrease the effectiveness of disenfecting? Also how long does the solution need to sit on a surface to actually disenfect it? Could you everclear instead of vodka? Hey Shannon, Yes, definitely! That would be even better. I suggest Vodka since everclear can be difficult to find in some places. Also, would both of these recipes keep for a month? With distilled water, my maximum storage is usually a month. Hi Lo, I’ve used both recipes in my home. So what about 80 proof or the 100 proof ? It seems most people purchase higher proofs for cocktails…….funny how anyone commenting is an expert ? I mean really who buys less than 80 proof?….I guess Brian ??? I think you should remove Brian’s comment ?? Hi- Does this have to be in a glass bottle? Or can one use a plastic spray bottle too? Hey Michelle, You can use plastic. Love your ideas. Instead of using an essential oil, could you heat the water along with some herbs such as rosemary or lavender, then steep and strain? Hey francine, I wouldn’t make this recipe. I would use 100% vinegar then. So glad I found your blog! I bought your book too!! After my daughter ate some store bought carpet powder (she’s fine, thank God!) 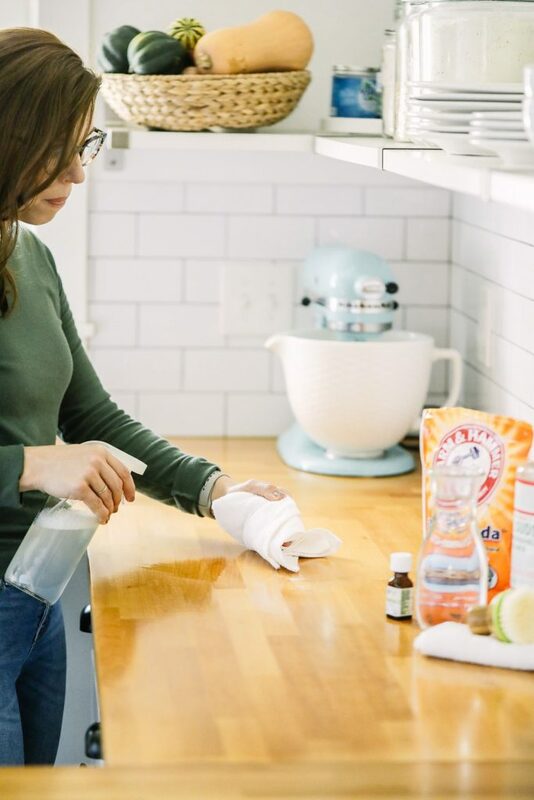 and after fighting a bout of strep throat in my home, I think I’m ready to make the switch to some natural cleaning solutions! Quick question on this disinfectant spray: what is its shelf life? Would you recommend using Oregano essential oil either with or in place of the Tea Tree oil? I’ve read that it is a great disinfectant. You could definitely try it. I personally always have tea tree on hand so that’s my go-to.